The Deadpool movie opens in a couple weeks and the affiliates are getting ready. Also February’s Nerd Block features DeadPool. Deadpool is crashing February’s Nerd Block Classic with his very own exclusive item, making for a month full of awesome surprises for all our subscribers! So far they list a Deadpool collectible, a Batman item, and something from Mario. The boxes always include a tee-shirt. It could be from one the characters above or something different, it’s a surprise. You can see previous nerd block in the links under this post. Remember buying via these links helps support this blog. This entry was posted on January 30, 2016 by Chris. 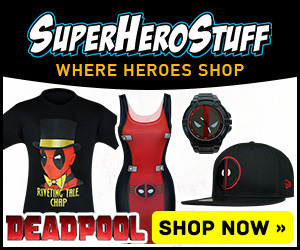 It was filed under Conventions, Super Hereos and was tagged with deadpool, mystery boxes, subscriptionbox.